Does the Former Ubuntu GNOME Remix Make the Grade? GNOME is one of the oldest desktop environments. Until Ubuntu 11.04, it was the default desktop environment for Ubuntu. Then the Ubuntu developers created a new graphical desktop called Unity. Unity sported a new and modern desktop environment, and next to it GNOME's age began to show. GNOME developers set about implementing changes, and the difference between GNOME 2 and GNOME 3 was huge. GNOME 3 is now every bit as modern as Unity. While Ubuntu ships by default with the Unity desktop, Ubuntu GNOME is another version of the desktop environment. The underlying architecture is the same and so most of the good bits about Ubuntu are available in both the Unity and GNOME version. Of course, this also means many of the bugs are the same as well. There are some subtle differences between Unity and GNOME, however, and which is better will be determined by what you are trying to do at the time. The main benefit of Unity over GNOME is the launcher down the left side of the screen. You can access your most commonly used applications with a single mouse click. To do the same thing with GNOME requires pressing the super key and then selecting an icon. Within Unity, if you are loading an application that isn't in the launcher you can either bring up the dash and start typing in the search bar, or click on the applications tab within the dash and open up the installed applications link to show all applications on your system. With GNOME the process is similar. Open up the activities window by pressing the super key and click on the bottom icon to show all of the applications. Using GNOME's keyboard shortcuts you can get to the same screen with a single keyboard combination of super key+A. The easiest way to find an application is to start using the search bar, but if you just want to browse, then GNOME makes that slightly easier. As soon as you get to the applications view you see icons for all of the applications installed on your system, and you can either page down or click on the dots to move onto the next page of applications. Within Unity, the screen is split into recently used applications, installed applications, and applications you might want to install. If you want to browse applications installed on your system, you have to click an extra link to expand the view to show those applications. It is therefore slightly easier to browse your installed applications with GNOME than it is with Unity. Of course, if you have hundreds of applications installed and you just want to see the games, in GNOME you have to use the search box. Though search is accurate, for browsing it doesn't work quite as well, and there's the possibility you won't have every game returned in the search that is installed on your system. Unity provides a filter while browsing your applications that offers categories such as games, office, audio, and others. Unity also allows you to filter by local applications and applications in the Software Center. This saves you opening Software Center and gets you to applications you want more quickly. Without a doubt, the desktop integration provided by Unity is better than the desktop integration provided by GNOME. The different lenses provided by Unity allow you to play songs, watch videos, view your photo collection and interact online without opening separate applications. Within Unity, you can filter the tracks by genre or decade but within GNOME you can create playlists and interact more fully with your audio. The video player provided with GNOME is the same one used in Unity, and they both suffer from a similar flaw. One of the search options within the video player searches YouTube, but when you try to search for YouTube videos, you get a message stating that YouTube isn't compatible. The applications installed on the Unity and GNOME versions of Ubuntu are essentially the same except for the email client. The Unity version of Ubuntu uses Thunderbird, whereas GNOME comes with the Evolution mail client. Evolution offers a better integration for appointments and tasks and the mail viewer is similar to that of Microsoft Outlook, making adoption of it easier for users. Of course, you are not limited to those email clients in either GNOME or Unity. You can install them on both if you have a preference for one. Both the Unity and GNOME versions of Ubuntu use the Software Center, which isn't surprising but is a little bit disappointing as GNOME normally comes with its own package installer which has a nicer interface. Boot times between the Unity and GNOME versions of Ubuntu are very nearly the same. GNOME perhaps performs a bit better than Ubuntu when navigating and for general use. One of the major differences between GNOME and Unity is who is doing the work on each project. Unity is the main focus for Ubuntu's developers, while Ubuntu GNOME is more of a community project. 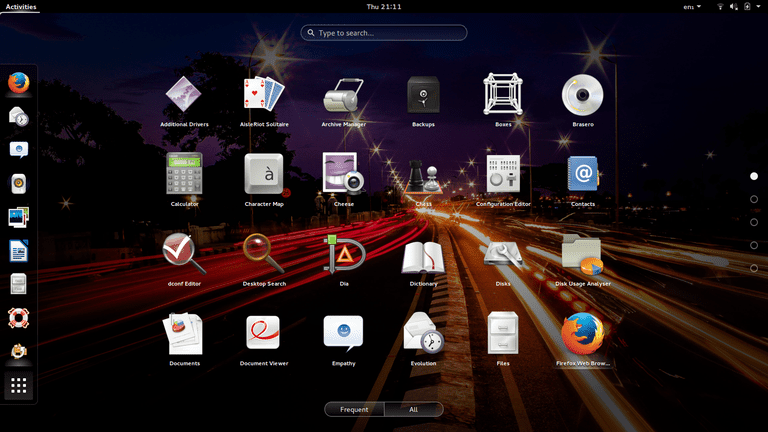 It is definitely worth giving the GNOME version a try, as the desktop performs slightly better and is less cluttered. The launcher takes up quite a bit of room, and although you can reduce the size or even hide the launcher, it isn't the same as having an empty desktop space to start. Unity, as mentioned earlier, does provide nicer integration for photos, music, video, and online activity. The filters within the individual lenses are also particularly useful. If you have already installed the main Ubuntu, uninstalling and installing Ubuntu GNOME is probably an effort without many improvements. If you want to try GNOME, though, open up the Software Center and search for the GNOME desktop environment. After the desktop has been installed you can select it when logging in.